Juliet Marillier is a marvel; she makes deep, complex, compelling stories read in an effortless fashion. And it doesn’t matter where in a series you pick up a book; they all read as if they are stand-alone novels, with the story being part of a larger world. I love that her characters have past histories and how those histories affect them – and how they either go on to be victims or manage to transcend what has happened to them to shape their own lives. 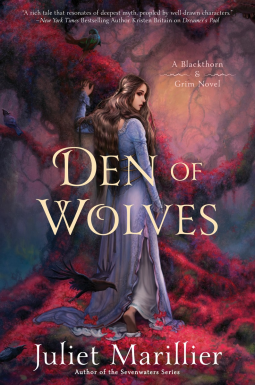 Although I’d read Marillier’s early work, Den of Wolves was my first foray into the adventures of Blackthorn, wounded healer, and her friend Grim, her comrade during the darkest time of her life. Now, for the first time, she has the chance to bring the sadistic tyrant who tortured her and many others to justice. But her life has become entangled with others, including Cara, a lord’s daughter sent to court under mystifying circumstances. Together Grim and Blackthorn unfold Cara’s secret and learn her true identity. In the end, Blackthorn has to make a choice between old revenge and the new life she has created for herself. The two story lines are woven together seamlessly, with dramatic tension beautifully balanced with character development and the daily rhythms of a non-industrialized sort-of mythic Ireland. I enjoyed the sense of spaciousness within the tale; nothing seems hurried, even when the action is intense. There’s a great sense of a world beyond the pages, and even minor characters have their own lives, motives, and sorrows. If you have not yet had the pleasure of exploring Marillier’s worlds, come on in. Sit down, have a cup of brew and listen to a tale or two. You’ll want to stay for a long while.